Baby Bubble is a world of passion for your baby’s wellness which provides gentle care and stimulating activities. A healthy experience targeted towards the natural development of your baby's motor, sensory, cognitive and relational skills. Baby Bubble is an innovative water and massage experience for your baby. An individual session for your baby who, thanks to his/her innate confidence with water, will be able to freely experiment, play and benefit from the most gentle and safe relaxation. “ WATER, WHERE LIFE TAKES FORM AND LOVE MAGNIFIES "
The post-natal period represents a moment of great discovery for your baby, who is gradually abandoning innate-reflexes phase to develop and experiment with voluntary actions, abilities and feelings, all influenced by the surrounding environment. Created to offer infants an integrated and harmonious treatment through the combination of water exercises, balneotherapy and baby massage. The objective is to nurture the autonomous and natural expression of the infants' body and feelings, so as to guarantee a healthy development, as well as obtaining and maintaining wellness and serenity. Water provides solicitations and stimulating experiences linked to natural movement in water, exploration and play. The partial immersion in a heat-controlled mineral-water pool. A relaxing and comforting regression to the mother's womb -BACK TO ORIGIN – which soothes and positively predisposes baby to the new stimulations. Massage is a well-being cuddle from our birth. A positive and loving touch influencing the energy-emotion balance. For its treatments, Baby Bubble offers only natural and plant-based cosmetic products, accurately selected to guarantee the balance of the infant's skin PH and to respect his/her delicate skin. A device to ensure a gentle floating which allows the infant a healthy and complete expression of the body's movements. Created and designed by Baby Bubble, it is certified according to safety standards and regulations for infants from 0 to 12 months of age (PPE – Personal Protective Equipment (EN13138-1:2014)). Made of soft, non-toxic and hypo-allergenic material, it guarantees the comfort and safety necessary to make this experience truly unique. Accurately designed to cater to all your baby's needs: indirect lighting system, ideal temperature, heated and sterilized water and other forms of care, all contribute to create a relaxing atmosphere which prepares your baby positively for the activities. The pools for water exercises come in various sizes so as to allow even the younger babies to gradually adapt to and develop the level of the activities. The gentle floating, the temperature of the water which reminds babies of the mother's womb, respecting the baby's natural body temperature, as well as the massage as a closing to the activities, stimulates the release of endorphins, hence allowing baby to enter a state of calm and serenity. Relaxation induces sleep, stimulates the appetite and soothes babies suffering from colics. The complete freedom of movement offered by the Baby Bubble Neck Floating Ring, together with the natural resistance supplied by water, stimulates flexibility, improves muscle and bone development, thus enhancing motor-skills aimed at deeper and more complex abilities such as manual skills, coordination and balance. Motor activities also produce beneficial effects on the development of the cardiovascular and respiratory systems. In the first few months from birth, babies like being lulled, cradled, and made to fluctuate on water and being carried by it. In water they can experiment safely and playfully with body movement to gain complete development. Playing during floating gives the baby and parents the pleasure of an experience of relaxing intimacy, well-being and harmony. The intense sensory solicitation during water activities, aside from broadening emotional development, also works as an incentive for the neuron-cognitive, learning, language and memory development. Your experience starts at reception, a welcoming and bright room in which we will work together to create a customized treatment for your baby. Before entering the water, you can enjoy the Relaxation Room where you can dedicate yourself to your child in a comfortable and fully-equipped area. Indulge in a precious and intimate experience in this area. We will assist you while discovering our world, in an environment created to deliver the best service in terms of design, comfort and total safety. Now you can sit back and enjoy all the benefits of our work: your child will be happy, healthy and relaxed even after the activities are over. The pig pool, entirely made out of glass, can accommodate children from 3 months of age. The temperature is controlled and maintained constant, as well as purified through a water treatment using fossil flour and a constant and electronically controlled time recirculation system. For the youngest babies, we offer the gentlest approach to water. A special treatment which consists in the immersion of your baby in an individual tank of purified and heat-controlled water. A gradual and soothing approach to water, during which the baby is cradled and gently rocked by the arms of a professional in total safety and tranquillity. At the end of the cycle, a delicate massage to obtain complete relaxation and loosening. The treatment dedicated to all babies. A joyful “swim-around” in the water for baby who, with the safe and gentle support of the Baby Bubble Neck Floating Ring, will be able to move freely and experiment with different stimulations generated by the activities performed, while gaining relaxation in the meantime. After the water cycle, the baby is given a soothing and gentle massage with extra-pure and cold-pressed almond oil. More cuddling, with a customized treatment including water activities and a massage. 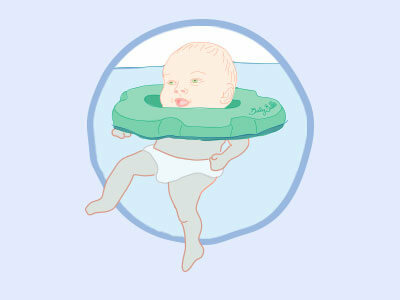 The whole cycle begins with relaxation and muscle-strengthening exercises, followed by water activities in which baby is kept afloat by the Baby Bubble Neck Floating Ring which allows baby to have fun, to put him/herself to the test and relax with the stimulations generated by the various activities offered. Following the water session, the baby is given a massage specific to his/her needs, both in terms of products applied and massage technique. Together, the activities designed for mothers who want to give their children a well-being treatment and healthy development in joyful company. Baby Bubble offers various possibilities of treatments in small groups: individual meetings, courses on a weekly basis and any other solution that meets your needs to give a healthy socialization to your children from the first months of life. 1. What must I take with me? All you need is nappies and a change of clothes. We will provide everything else you need. 2. What documentation is needed to take part in the activity? We require a copy of your vaccination certificates. 3. How long does a session last? Approximately 50 minutes, depending on the unique attitude and disposition of each baby. The ratio between the time spent in water and the time spent being massaged will be evaluated according to baby's mood and condition during each session. 4. Can I take a guest with me? During the activity, to guarantee the best conditions and tranquillity for the child, no more than two people are allowed in the pool room for each baby. At our staff's discretion, more people can be allowed inside the tank room depending on how many people are already present in the room. 5. Can my baby come even though he/she isn't vaccinated yet? Yes, the single-use tanks have been specially designed so that even the younger ones can participate. Even if they haven't been vaccinated yet, they can enjoy the experience freely and without second thoughts. 6. At what age can my baby start? The smaller pools can be used literally from birth and until the first vaccination; the bigger pool accommodates children up to 12 months (depending on stature/peculiarities of the child). 7. Can I buy treatments package? Yes, Baby Bubble offer packages of 3, 5 and 10 treatments. We will work together to create the best plan for your baby. 8. What is the cancellation/change of appointment policy for the sessions? It is possible to cancel or make a change on the appointment within 24 hours prior to the session. 9. Is it possible to buy a gift-voucher? Yes, with validity of one year starting from the date of purchase. For more details, please contact us and we will help you choose the best options for your gift-voucher. 10. Is it possible to organize group sessions with other mothers/friends? It's possible, get in touch with us and we will arrange every detail of your experience. Is there anything else you'd like to ask which you haven't found on our website? Contact Us!